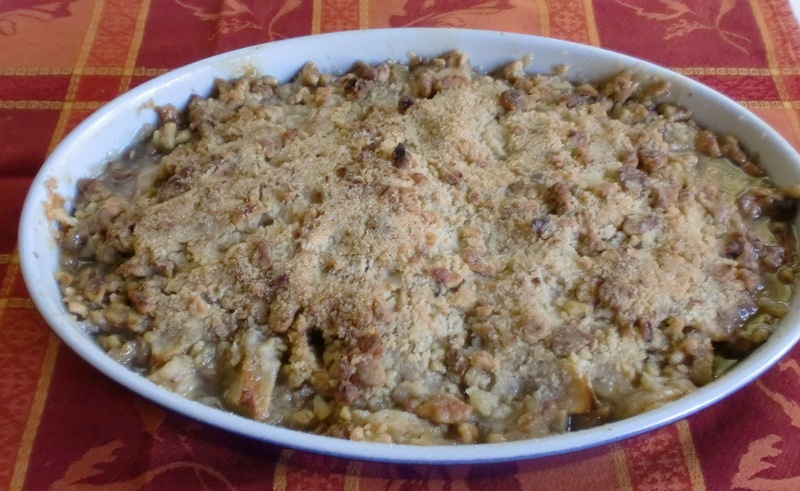 This is a homey but wonderfully flavorful apple dessert. Using a varieties of apples is best. Butter a 9 inch oval ovenproof dish. In a large bowl combine apples and light brown sugar. Add maple syrup and lemon juice. Mix well and transfer to baking dish. Mix flour, sugars, cinnamon, nutmeg and salt in a food processor. Add cut up pieces of cold butter. Close top and pulse until the mixture resembles small peas. Add pecans and pulse until nuts are chopped into medium pieces. Sprinkle over apples. Bake for 45 min. until top is golden and apples are cooked. Serve hot or at room temperature.